In Bombay, 1973, Caityaguru dasa was in charge of the gardens at the time. After my arrival, Caityaguru asked me to come and see Srila Prabhupada. After entering Srila Prabhupada’s room, I found His Divine Grace lying on his mattress with big gigantic pillows under his feet and head. We offered our obeisances. Then Srila Prabhupada and Caityaguru started making jokes and laughed while conversing in Hindi. When the opportunity arose I asked Srila Prabhupada what service he would like me to do here in Bombay. Srila Prabhupada replied, “I want you to plant one flower on every square inch on Hare Krishna Land." We offered our obeisances and then left. Somewhat confused by the instruction just received, Caityaguru suggested that we go see him again the next day for an expanded explanation. Again upon entering his room the following day, Caityaguru and Srila Prabhupada started laughing while talking in Hindi. I asked Srila Prabhupada about growing vegetables. Srila Prabhupada answered that because of the limited space it would be cheaper to buy them in the local market rather than grow them. Then I asked him what about fruit trees? He replied that, “Yes grow bananas, chicos and guavas.” Immediately after receiving this additional instruction, I started arranging for planting a variety of fruit trees in Srila Prabhupada's yard. I had already began tearing down Narayana’s garden in order make room for the new flower yard. After the fourth day, I received the instruction. Srila Prabhupada and many devotees during his morning walk stopped the procession and looked in the direction of the newly upcoming flower garden and Srila Prabhupada asked why one of the plants was brown? I immediately mentioned that I was thinning out some existing mogra plants and had transplanted them to other areas on Hare Krishna Land, thinking that to waste them would be sinful. Srila Prabhupada, upon hearing this, yelled at me saying that this transplanting must stop immediately. "The plants are suffering because of it. When you have planted a plant keep it where it is, don’t move it." Srila Prabhupada kept bringing up this point during the next several morning walks. I felt great inspiration working in the yard because Srila Prabhupada kept observing me closely every day during his massage on the rooftop. Bombay, 1974. I was put also in charge of maintaining the Tulasi plants that were growing in a fenced in area in the front of the temple. Unfortunately some of them were not doing too well. While I tried my level best to get them healthy, I had no success. During a walk one morning, Srila Prabhupada asked me what was the matter with some of the Tulasi plants that were apparently dying. I told him that I would check into it further as to why they weren’t doing well. That same day after investigating the root systems, I discovered that ants and termites had infested the roots. Srila Prabhupada inquired the next day what the results were of my investigation. I told Srila Prabhupada that termites and ants were eating their roots. Srila Prabhupada then said, "You take one part lime and one part sulfur and mix that with ten parts water and sprinkle the mixture around Tulasi. This will drive the insects away." Shortly after Srila Prabhupada departed for his next world tour. During Srila Prabhupada’s absence I applied his formula immediately to get rid of the ants and termites. The infestation had advanced too far for the formula to work on time and unfortunately all of the Tulasi plants died. Srila Prabhupada returned back to Bombay from his world tour. After returning from his morning walk the following day, His Divine Grace noticed immediately that the Tulasi plants were gone. The entire yard was vacant, fence and all. During the Gurupuja after the walk, he called me over and yelled, "What happened to the Tulasi’s?" I told him that I tried to save them. I immediately offered my obeisances and disappeared out of site. During the next day's morning walk, Srila Prabhupada stopped and noticed the new Tulasi garden that I had started. Srila Prabhupada asked how these Tulasi's were doing. I told Srila Prabhupada that the Tulasi plants were doing fine but there were spider mites and aphids eating Tulasi’s leaves. Angrily Srila Prabhupada yelled at me saying, “Leave the insects alone, let them eat as much as they want. Who are you to kill them?”, showing his compassion for all living entities. I experimented with different ways to get rid of the insects without killing them with great success. Srila Prabhupada asked me on a morning walk how much ghee I was using in the kitchen cooking for Krishna and the devotees. I said I was using a kilo a day. Srila Prabhupada said that it was too much. So I proceeded to cut it to a half a kilo a day. The next morning on a morning walk I said proudly to Srila Prabhupada that I had cut the ghee to half. Srila Prabhupada then replied, "You don’t know how to cook. That is still too much ghee to use." For two months I had been trying to figure out what question to ask him since I hadn’t asked any questions before. I was again very proud and puffed up with the question I was about to ask him. As we were walking down to Juhu Beach, there came a silence and just chanting japa. I took this moment to go up to Srila Prabhupada. I said, "Srila Prabhupada can I ask you a question." He simply said, Yes?" I asked, "Srila Prabhupada when they drill deep into the ocean to get oil when this oil comes up and mixes with water, land and air is this the cause for disease?" Srila Prabhupada immediately broke the silence and said, "This whole world is a disease and you should simply try to get out of it." Dr. Patel immediately jumped in the conversation and the two started arguing the longest time about disease and the material world. One day Srila Prabhupada was on his way to London and we were all going to the airport to see him off. In the fruit orchard I picked my first bunch of strawberry bananas and took them with me to the airport. Everyone was sitting in the terminal where Srila Prabhupada was speaking. I walked up to Srila Prabhupada with the big bunch of strawberry bananas. Srila Prabhupada's eyes opened very wide and said, "These are our bananas?" I said, "Yes Srila Prabhupada I have grown these bananas for you." He immediately took one and ate it and said, "These are very good and now pass them out to everyone." Immediately after that Harikesa jumped up on a table and started preaching while I was passing out the bananas. I felt very good about growing all these different kinds of fruits for Srila Prabhupada. On one special day, Harikesa asked me to help to him cook and serve Srila Prabhupada’s lunch. We made his lunch and served Srila Prabhupada his lunch in his room. The first thing he asked was to mash the potatoes with his bitter melon and I brought hot chapatis and cooked them. I served him his whole lunch and felt very good. That night I decided to make Srila Prabhupada some five vegetable samosas. I made a bunch of them. I sent them up to Srila Prabhupada. The next day Harikesa again asked me to help him cook lunch for Srila Prabhupada. An Indian cook had come before we got to the kitchen and cooked lunch for some special guests. Harikesa and myself still had to cook lunch for Srila Prabhupada. In the middle of our cooking Srila Prabhupada walked into the kitchen. On the right hand side of the kitchen all the preparations for Srila Prabhupada’s guests were laid out, including a big diamond shaped samosa. The five vegetarian samosas that I had made for Srila Prabhupada were called half-moon samosas and were quite large. Srila Prabhupada looked down at the plate of samosas that the Indian cook had made for his guests and looked at me and said. "You don’t know how to make samosas. You only know how to make footballs." Smiling he looked at Harikesa and myself and said, "You two always mess up everything," and walked out of the room smiling. 1976, evening darshan. The room was filled with devotees and guests and Srila Prabhupada was answering questions. I asked Srila Prabhupada, "What benefit will all these flowers get when they're are offered to you?" Srila Prabhupada replied, "Every flower that you offer to Krishna or the spiritual master, the plant that produced the flower becomes a human being in his next life," answering my question. 1976. Srila Bhaktisiddhanta Sarasvati's Disappearance. Gopal Krishna, the GBC at the time, asked me to cook a feast for Srila Bhaktisiddhanta to offer Srila Prabhupada. I made 98 of the 108 preparations offered to Srila Bhaktisiddhanta. The whole offering to Srila Bhaktisiddhanta was brought up to Srila Prabhupada. Gopal Krishna said, "Because you cooked most of the preparations you should bring them to Srila Prabhupada and explain what they are." Srila Prabhupada tasted one preparation and asked what it was and I explained. After the fifth preparation was tasted and I explained what it was, Srila Prabhupada remarked, "Radharani has cooked this feast." I left and felt very happy to receive such a blessing. 1973 Mayapur. I was in Bombay taking care of the gardens. The first time Srila Prabhupada called me from Calcutta, he told me to come to Mayapur to help with the gardens there. Giriraj gave me a third-class train ticket to Calcutta. By the time I got to Calcutta all my luggage including my shoes were stolen. I arrived at the Calcutta temple with just a dhoti and kurta. I talked with Gargamuni and he gave me some extra clothes. The next day I was off to Mayapur. I arrived in Mayapur late afternoon and was taken to the brahmacari quarters in the only existing building at the time. The next day Srila Prabhupada came down the stairs for his morning walk followed by his disciples. 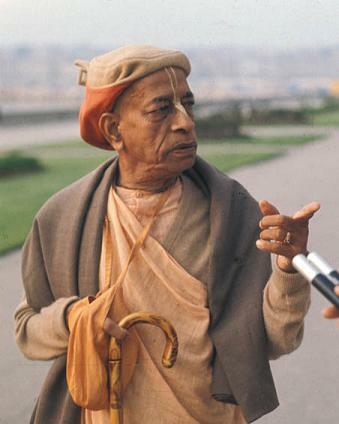 Bhavananda told Srila Prabhupada that the flower boy from Bombay had arrived. He looked at me and proceeded toward the Caitanya Math while discussing various topics with his senior leaders. On our way back from the Math and entering the compound we started walking towards the building. I noticed some cows to my right and went over to pet them as the procession was near the building. All of a sudden the procession stopped. Srila Prabhupada turned around and yelled, "Sanka come here!" I ran down to where he was and he mentioned that he wanted me to plant trees on both sides of the road. Immediately after breakfast, Jayapataka and the Bengali devotees started digging up small coconut trees and planted them at both sides of the road, which are still standing today giving coconuts seasonally.